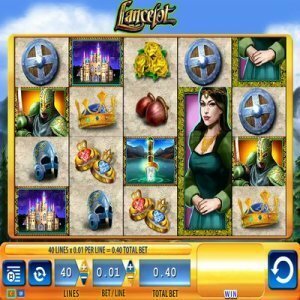 [miau] Lancelot is a 5-reel, 40-payline slot machine that was once a successful machine in actual live casinos. Since then, the game has been re-imagined and recreated in an online slot format. The idea of the slot machine game itself is to give users a glimpse at the past, in the form of medieval times. It was released on the WMS gaming platform and made available online in October of 2012, so it is still a relatively new machine. With cool characters, many ways to win, and a free spins bonus feature, Lancelot slots can keep players busy and entertained for hours. One of the first features players notice about Lancelot is its historical reference point. Join Lancelot and the Knights of the Round Table, per the Arthurian legend, and spin your way to potential victory. The story itself centers on Lancelot and Guinevere’s secret and sordid love affair, which provides the game with a cool feature in itself since both become wild and bonus symbols on the slots. Other symbols of the game include: Crowns, castles, swords, helmets, armor, and more. The background of the machine is also well designed. With a baby blue backdrop, the colors of the main characters and symbols on the reel really pop well. This is particularly true on modern machines with HD graphics. The colors pop and stand out very vividly. Players will notice the stacked Lancelot and Guinevere symbols on the reels. When a player receives two or more of these symbols consecutively, the bonus symbols then launch the free spins feature. Not only do players have a chance at a free spin, but since these symbols are also wild, there’s also an increased chance of hitting a bigger prize on each individual spin. Any win that happens during the bonus feature is doubled and may be retriggered. Players who aren’t all that thrilled about risking a lot of money may really appreciate the betting features of Lancelot. You can bet anywhere from a single penny all the up to 200, meaning this is the perfect slots game for low and high rollers alike. The payouts are also rather generous, considering that we’re still talking about a slot machine, after all. Like with any slot game online, there are pros and cons with the Lancelot game. One of its strong suits is that it’s a very attractive game that really stands out in vivid color when playing it. Where it might fall short in some people’s expectations, however, is that the premise is quite simple. There’s no real video story to speak of, and there’s no build up to anything. Although you are playing the famous Lancelot theme, it would be really cool if more of the story were interjected into the slot game itself. However, there are many different ways to bet, and even more ways to win. This in itself makes Lancelot stand out compared to a lot of slots out there. You never have to worry about biting off more than you can chew. If you want to slow-roll your way through slots, multiple betting options are available.